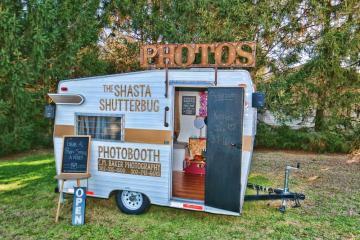 The Shasta Shutterbug is a mobile photobooth perfect for any wedding, birthday party or outdoor event. The Shasta comes fully loaded with many props to choose from to use in your photos. With the ability to customize the photobooth strips and the chalkboard door, it is sure to be a perfect fit for your upcoming event! Call us for pricing details. We also have a standard photobooth for inside capabilities. It can be enclosed (with adjustable sizes to suit your needs) or open air with a backdrop and the ability to put many people in the picture.